The Samsung Galaxy S DUOS GT-S7562 model got a new Ice Cream Sandwich update, The new software update is XXBNE2, It is also Android 4.0.4 version, But for sure there are some fixes and improvement included in this version, So it is very important to update your Galaxy S Duos GT-S7562 software by installing XXBNE2 firmware package. This Tutorial will guide you step by step to install the new XXBNE2 firmware update package by using Odin3 flasher, You can find in this tutorial all the needed programs and files to perform the update process, So read the steps to learn how you can update your Galaxy S Duos by yourself. In this Tutorial we used the S7562XXBNE2_S7562ODDBNE1 update package as an example, This one is for India, But you can download and install the suitable one for your country or carrier, All the available S7562XXBNE2 firmware update packages can be downloaded at our Free Samsung Support Section. ALL IN ONE SUPPORT Here All Kind of Mobile Flash File Hardware solution And Flash Tutoriall Free Download. Samsung Galaxy S DUOS GT-S7562 USB Driver. S7562XXBNE2 Firmware Update Package, Select the suitable update package for your country or carrier. 1- Download Odin3 flasher and extract it. 2- Extract the S7562XXBNE2 Firmware Update Package. 3- Download and install the Samsung USB driver. 5- Backup any wanted data on your device. 6- Charge your device battery to be at 80% minimum. 7- It is better to make Factory Data Reset, That can keep you away from some errors later. 8- Enable USB debugging option. 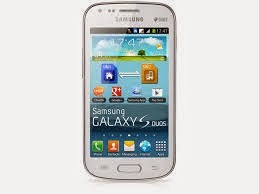 1- Turn off your Galaxy S DUOS GT-S7562, Remove any SIM or Memory cards. 2- Put your Galaxy S Duos into Download Mode. 3- Connect it to your Computer using the USB cable. 4- Wait for a couple of seconds to let your PC recognize the device. 5- Run Odin3.exe as Administrator. 6- Make sure that Re-Partition option is not checked. 9- Click on Start button, Odin3 will begin to install the new firmware on your device. 10- After the installing is done, Your Galaxy S Duos will be rebooted automatically. 11- When your device is on again, Disconnect it from your PC. 12- When it is completely on, Check the new installed firmware. 13- Done, And now you have the new XXBNE2 firmware installed on your Galaxy S Duos GT-S7562.